In the tradition of skilled storytellers, Richard Hague takes his time drawing all the details in these 22 Appalachian stories in Learning How. “Aunt Aggie” is a powerful and tender story and a charming treatment of relationships in the extended family, as two boys enjoy “liberating her for an afternoon from the nursing home and ride her around town in Jack’s ford, listening to her memories and tales.” After a long day driving through town, they head to a bar. “Sit down on either side of me, and keep that bottle moving,” she says. As she sits high and erect on the bar stool, they look out over the river, and sip brandy. After listening to her stories, they return her to the nursing home, where no one notices how woozy she is. 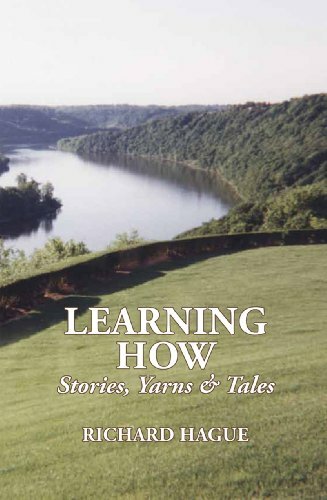 The title story, “Learning How,” is an energetic walk through the story-telling tradition, in which the narrator struggles to find approval as a storyteller, to finally tell a yarn like the best of them. It’s then that he fully learns that a story about storytelling can be about both what’s true and what ought to be true. Mr. Hague’s studied delivery, vivid color descriptions, and sense of place imagery make Learning How a storyteller’s delight.